When you own a business in one of the most fast-paced cities in the world, you come to learn rather quickly that there is very little in the form of down time. From the instant your eyes open each morning (which is only a few brief hours after they actually closed), your feet move at full speed (despite the fact that your mind is still half asleep), your arms cart a half dozen boxes whose labels you never even had a chance to read, and before you know it the sliver of skyline you glimpse through the front window of your shop becomes cast in shadows and somehow -- somehow -- you realize you did it again: crossed another day off the calendar, though you barely remember any of it. Did you ever see a cartoon character who moves so fast that his feet become surrounded by a cloud of dirt? It's a little bit like that. Even before the shop existed, and we were still operating as a part-time pop-up only operation, this time of year -- the weeks leading into the holiday season -- were always the craziest. It was the time of year when, in the matter of a single weekend, we'd go from doing nothing to running six different pop-ups in six different neighborhoods throughout the city all at once. In the past, this was the period when the chef and our business partner would hold meetings in our living room at all hours of the night as they discussed how to make the many moving parts of operating multiple pop up markets manage to work. It was the period when, on any given weekend, someone would be forced to sleep on our couch, an alarm set for every two hours so the assigned individual could check the constant rotation of meat that slowly braised in our small apartment oven. It was the period when our home stairwell transformed into a makeshift storage room, stacks of extra hotel pans, plastic squeeze containers and food processor blades piled against the walls, ready to be grabbed and whisked off to an undisclosed pop-up venue at a moment's notice. This year, as late October rolls out, and the early days of November roll in, life doesn't seem to be too different. While most of the recipe testing now happens in the shop's commercial kitchen (to celebrate our home kitchen being a little less of a disaster, I've purchased new wall art and a few new chairs, both of which I'm far too excited about), everyone in these parts still looks a bit too much like that same frenzied cartoon character. In the past week, we officially reached our ten week anniversary, we closed up shop at a market in midtown, we participated in a one day market sponsored by New York magazine, we opened up shop at a brand new market in Herald Square, and we got things rolling at another nights-only market over in Brooklyn. Simply put, there has been a lot of shuffling, a lot of assembling, a lot of physical aching, and not a lot of sleeping going on in these parts. Recently, I read an essay in Kinfolk titled "How to Do Nothing," which was about -- well, you guessed it -- the pleasure of sitting and doing nothing at all. Last Sunday, for the first time in a long time, the chef and I were blessed with a day for such a task -- a day away from the all consuming world of our business and to-do lists. It was a day meant for pleasure and relaxation instead. What I've come to learn about our shop is that, even when we are away from it, it is never really very far away from us. Even when we are physically removed from it, it is still often the center of our conversation, our actions and our thoughts. And so, last Sunday, on our rare day home together, the idea of doing nothing turned out to be less about doing nothing on a literal level, and more about doing nothing related to the shop instead. So we slept in. We visited the farmers' market in search of food for our home kitchen, taking our time to browse the produce rather than absently tossing as many bitter greens as we could fit into a canvas tote bag. We sat on the couch and talked about other areas of our lives that we've been neglecting to discuss simply because of time. For dinner, we sat together and ate a proper meal -- a slowly roasted whole chicken and gently simmered ribbons of buttery collard greens. And somewhere, in between all that, we baked a loaf of fresh bread. While baking a loaf of bread certainly qualifies as doing something, it is the perfect activity for a day of doing nothing. It is not the sort of task that can be rushed. You must wait while the yeast takes its time to blow out soft bubbles. The dough demands you to take a seat and relax while it slowly rises, doubling in size. Just when you think it is time for you to spring into action, the dough begs you to give it a few squeezes, and then to go away and do a bit more relaxing so it can rise again in privacy and in peace. 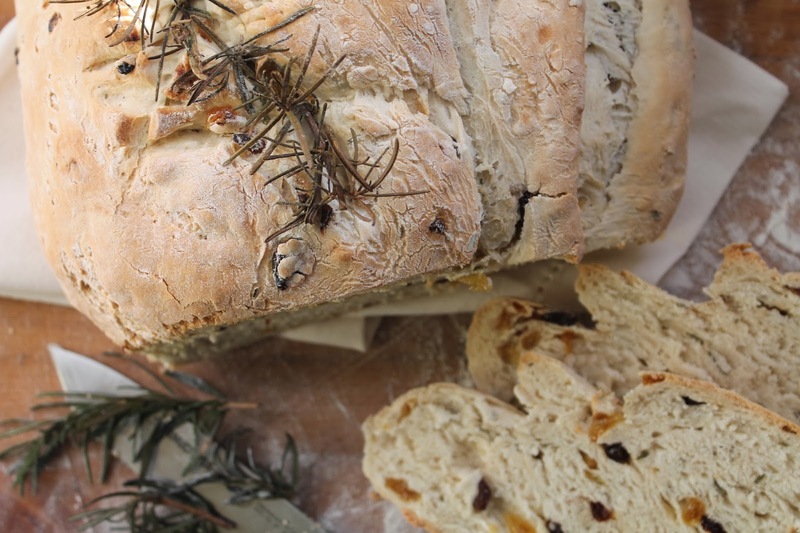 This Rosemary and Raisin Boule is borrowed from Jamie's Kitchen. The yeasty dough bakes into a mountain of perfect white bread that is flecked with sweet chopped raisins and is scented with a deep, earthy aroma of rosemary. The final loaf is quite large; however, the bread freezes well, so feel free to slice up a portion of it and pop it in the freezer for later use. I hope you'll enjoy it on your own day of nothing. Feel free to leave a comment to let me know your thoughts. In a medium-sized bowl, dissolve the yeast and sugar in half of the warm water. Set aside. Add the flour and salt to a large bowl. Make a well in the center of the flour and pour in all of the dissolved yeast mixture. Slowly mix the yeast mixture into the flour until all of the yeast mixture is soaked up. Pour in the remaining warm water and gradually mix to make a moist dough. Set the dough on a clean work surface and knead for about five minutes, periodically adding in the chopped rosemary and raisins. When finished kneading the dough, form it into a roundish shape and place it on a baking sheet. Lightly flour the top of the dough. Carefully score the dough down its center. Cover the baking sheet with plastic wrap and place in a cool oven until the dough doubles in size, about 30 minutes. Remove the baking sheet from the oven. Knead the dough for 2-3 minutes, and then reform it into a roundish shape. Place the dough back on the baking sheet, carefully score it once more, cover it in plastic wrap, and place the baking sheet back in the cool oven. Allow the dough to rise again until doubled in size, about another 30 minutes. Remove the baking sheet from the oven. Preheat the oven to 350 degrees. Remove the plastic wrap and poke the reserved rosemary stem in the center of the loaf. Bake until golden and crisp, about 25 minutes.